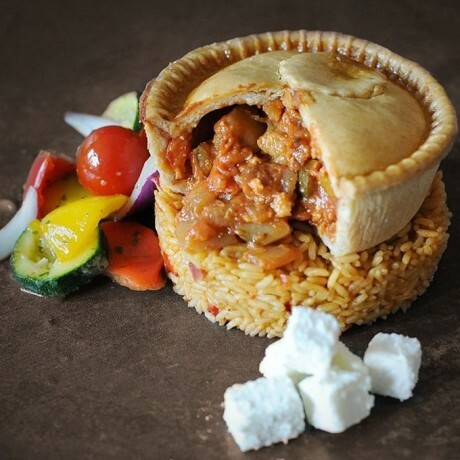 Premium pies lovingly handcrafted using only locally sourced ingredients, including British beef, poultry and fresh vegetables. 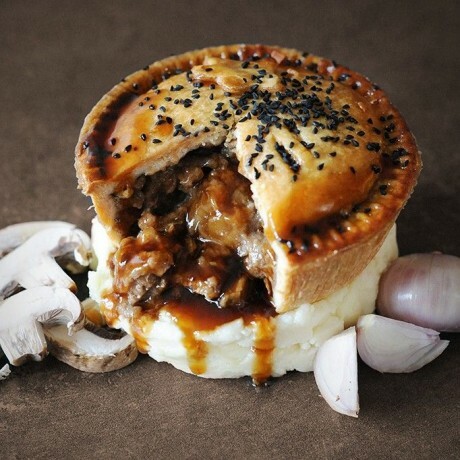 Topping's Pies have won many awards for their pies and pride themselves on their tender meat, delicious sauces, and great flavour. Shelf life: Fresh shelf life of 7 days, keep refrigerated. 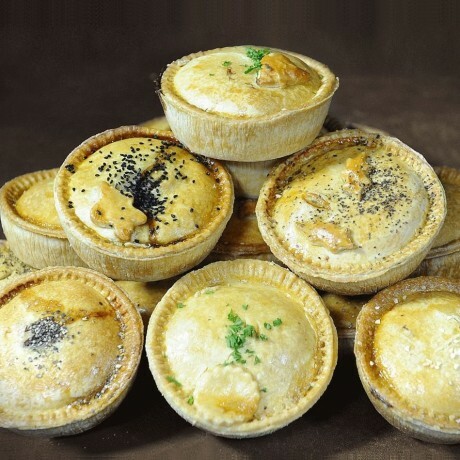 All these pies are perfect for freezing, freeze on day of delivery for up to 12 months. Steak, Shallot and Portobello Mushrooms: Beef (24%), Fortified WHEAT Flour [WHEAT flour, Calcium Carbonate, Iron, Niacin(B3), Thiamin(B1)],Water, Lard, Portobello Mushrooms (9%), Shallots (6%), Gravy Mix [Fortified WHEAT Flour (WHEAT flour, Calcium Carbonate, Iron, Niacin(B3), Thiamin(B1)), Modified Maize Starch, Salt, BARLEY Malt Extract, Onion Powder, Leek Powder, Natural Flavouring, Yeast Extract, Spice, Herb, Spice Extract, Herb Extract], Salt, Glaze [Maltodextrin Potato, Dextrose, Cornflour, Stabiliser(Carboxymethyl cellulose), Colour (Beta Carotene), BARLEY Malt Extract]. Premium Steak: Beef (29%), Water, Fortified WHEAT Flour [WHEAT flour, Calcium Carbonate, Iron, Niacin(B3), Thiamin(B1)], Lard, Gravy Mix [Fortified WHEAT Flour (WHEAT flour, Calcium Carbonate, Iron, Niacin(B3),Thiamin(B1)), Modified Maize Starch, Salt, BARLEY Malt Extract, Onion Powder, Leek Powder, Natural Flavouring, Yeast Extract, Spice, Herb, Spice Extract, Herb Extract], Salt, Glaze [Maltodextrin Potato, Dextrose, Cornflour, Stabiliser (Carboxymethyl cellulose), Colour (Beta carotene), BARLEY Malt Extract]. 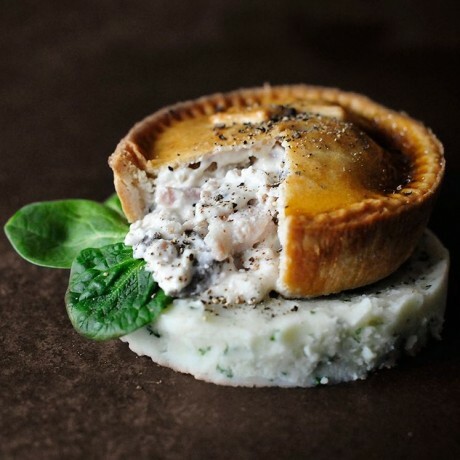 Steak and Mature Stilton Cheese: Beef (29%), Water, Fortified WHEAT Flour [WHEAT flour, Calcium Carbonate, Iron, Niacin(B3), Thiamin(B1)], Lard, Gravy Mix [Fortified WHEAT Flour (WHEAT flour, Calcium Carbonate, Iron, Niacin(B3), Thiamin(B1)), Modified Maize Starch, Salt, BARLEY Malt Extract, Onion Powder, Leek Powder, Natural Flavouring, Yeast Extract, Spice, Herb, Spice Extract, Herb Extract], Blue Stilton(MILK)(4%), Salt, Glaze [Maltodextrin potato, Dextrose, Cornflour, Stabiliser (Carboxymethyl cellulose), Colour (Beta carotene), BARLEY Malt Extract]. 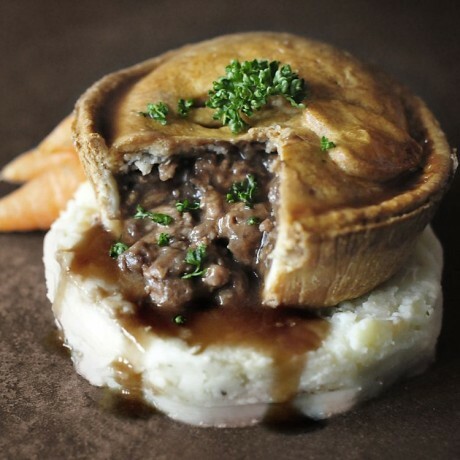 Steak with Yorkshire Black Pudding: Fortified WHEAT Flour [WHEAT flour, Calcium Carbonate, Iron, Niacin(B3), Thiamin(B1)],Beef (25%), Water, Lard, Black Pudding (9%)[Water, Pork Fat, Rusk, Pearl Barley, Dried Pork Blood, Wheat Flour, Salt, Dried Onion, Spices, Herbs, Whey Powder(MILK), Potato Starch, Onion Powder, Spice Extract, Herb Extracts(CELERY)], Gravy Mix [Fortified WHEAT Flour (WHEAT flour, Calcium Carbonate, Iron, Niacin(B3), Thiamin(B1)), Modified Maize Starch, Salt, BARLEY Malt Extract, Onion Powder, Leek Powder, Natural Flavouring, Yeast Extract, Spice, Herb, Spice Extract, Herb Extract], Salt, Glaze [Maltodextrin Potato, Dextrose, Cornflour, Stabiliser (Carboxymethyl cellulose), Colour (Beta carotene), BARLEY Malt Extract]. Creamy Cracked Black Pepper Chicken, Wiltshire Ham and Portobello Mushrooms: Water, Fortified WHEAT Flour [WHEAT flour, Calcium Carbonate, Iron, Niacin(B3), Thiamin(B1)], , Chicken(20%), Lard Wiltshire Cured Ham (7%)[Pork, Salt, Preservatives (Potassium Nitrate, Sodium Nitrite)], Sauce Mix [Fortified WHEAT Flour (WHEAT flour, Calcium Carbonate, Iron, Niacin(B3), Thiamin(B1)), Cream Powder (MILK), Modified Maize Starch, Salt, Sugar, Spices, Onion Powder, Yeast Extract, Herb, Spice Extract, Herb Extract (CELERY)], Portobello Mushrooms (2%), Salt, Glaze [Maltodextrin Potato, Dextrose, Cornflour, Stabiliser (Carboxymethyl Cellulose), Colour (Beta Carotene), BARLEY Malt Extract]. Roasted Mediterranean Vegetables with Tomatos and Goat's Cheese: Water, Mediterranean Vegetables (25%) [Red pepper, Yellow pepper, Courgette, White Onion, Sunflower Oil, Fortified WHEAT Flour [WHEAT flour, Calcium Carbonate, Iron, Niacin(B3), Thiamin(B1)], Sauce Mix (Tomato Powder, Fortified WHEAT Flour (WHEAT flour, Calcium Carbonate, Iron, Niacin(B3), Thiamin(B1)), Modified Maize Starch, Salt, Dried Tomato, Potato Powder, Sugar, Dried Onion, Dried Garlic, Herbs, Dried Mushroom, Hydrolysed Vegetable Protein(SOYA), Natural Flavouring, Onion Powder, Yeast Extract, Spice Extract], Margarine [Palm oil, Rapeseed oil, Water, Salt, Emulsifier (Polyglycerol esters of fatty acids), Colours (Curcumin, Annatto)], Shortening [Rapeseed oil, Palm oil], Goats Cheese(MILK) (2%), Glaze [Maltodextrin Potato, Dextrose, Cornflour, Stabiliser (Carboxymethyl cellulose), Colour (Beta carotene), BARLEY Malt Extract],Salt, White pepper.